Dumped, Drunk and Dalish: Everybody Sings! The Importance of "The Dawn Will Come"
Every good videogame (or story) has a pivotal moment. If it's especially good, it's one in which you get goosebumps and go, "Oh, my God, what just happened?" A moment in which you wonder how you went from detachment to utter investment... and suddenly those pixellated figures have become as lovely and moving as real people to you. 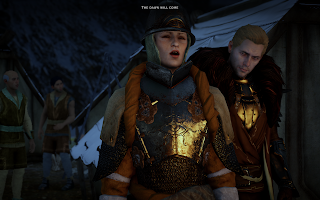 For me, that moment came in DAI, after the massive story break that occurred with the destruction of Haven and the Inquisitor's slow, painful journey back to her companions. When Mother Giselle confronts us about life and courage and faith, and tries to encourage our Inquisitor and their tired companions and advisers with a song... right there, even though my character was an unbeliever, that's when I fell hard for DAI on a permanent level. be deleted before the finalization of DAI. I'm so glad it lived! Secondly, it's just so damn risky! Right in the middle of the game, right after we've experienced terror and loss, suddenly everyone is singing this big gorgeous song... and if you're me, you're gobsmacked and in tears. It was a pivotal moment for me in my journey through Dragon Age, and I'll always love the fantastic David Gaider for envisioning and championing it. And I'll always love it. I love the complexity of the moment—the vital break so that we can pause, look around, and realize even our advisers are simply tired, scared people who have just lost everything—friends, belongings, their Haven (and their haven). Mother Giselle: Our leaders struggle because of what we survivors witnessed. We saw our defender stand, and fall. And now we have seen her return. The more the enemy is beyond us, the more miraculous your actions appear. And the more our trials seem ordained. That is hard to accept, no? What we have been called to endure? What we perhaps must come to believe? Mother Giselle: Of course. And the dead cannot return from across the Veil. But the people know what they saw. Or perhaps what they needed to see. The Maker both in the moment and in how it is remembered. Can we truly know the heavens are not with us? Mother Giselle: Scripture says magisters, Tevinter servants of false old gods, entered the Fade to reach the golden city, seat of the Maker. For their crime they were cast out as darkspawn. Their hubris is why we suffer Blight and why the Maker turned from us. If such is the claim of this Corypheus, he is a monster beyond imagining. All mankind continues to suffer for that sin. If even a shred of it is true, all the more reason Andraste would choose someone to rise against him. After a little more conversation, the Inquisitor, sad and tired, and possibly not too sure on the subject of faith here, walks away. As they do, we see our advisers, and Josie looks tired and sad. Cullen and Cassandra, too, look angry and hopeless. And then something truly amazing, lovely, and yet seriously cynical happens: A song. Out of the blue. "The Dawn Will Come" is a beautiful piece, a soaring reinforcement of faith and belief in the uncertain darkness. Minor Side Note: I know that "The Dawn Will Come" has gotten some criticism in the DA fandom community, as some fans have endlessly debated the melodic similarity of its opening line to Pippin's Song (a beautiful moment in The Lord of the Rings: The Return of the King as created by Billy Boyd and writer Philippa Boyens), but I feel like that's actually coincidental and deceptive. My long answer: For what it's worth, my take is that the first few bars are similar melodically, but that the songs ultimately go to different places. Pippin's song is also a single refrain with no chorus, while TDWC ultimately evolves to something different and more fully realized. Short answer: I love them both. sing once more is a genuinely meaningful story moment. So back to my topic. Everyone's tired and depressed. Then Mother Giselle sings. It's a beautiful song, but it's also vital to note that it's a hymn. It's a religious piece, a song everyone in the Chantry presumably knows. And it's metaphorical, of course—the dawn comes every day, after all, but in our souls, we've all had times when we could not see an actual dawn upon our future horizons. And yet maybe if someone had sung this, we might have felt a little bit better. As Mother Giselle's voice falls into the silence, Leliana looks up from her sadness, and Josie visibly brightens, sitting up straight and smiling. Cass, too, stops brooding and looks up from her maps. 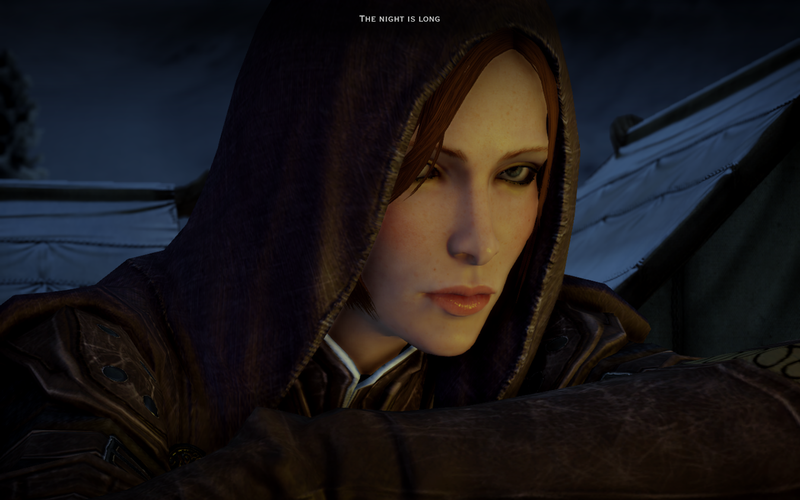 Then Leliana joins in with her high, girlish voice (and it's such a big moment for any of us who played DAO, and who still remember the loveliness of the young Leliana's song beside the campfire). Then Cullen joins in, along with the survivors, soldiers, and onlookers (and thanks to Jonny Rees, Cullen's voice is just as predictably beautiful as his hair). As the song winds to its close, we see Cole tending quietly to Roderick, who has passed away. I always headcanon that he lived to hear the song, since it would have meant so much to him as a man of faith, and that he died even as it soared around him. Slipping into darkness while listening to a beautiful song, holding Cole's compassionate hand? 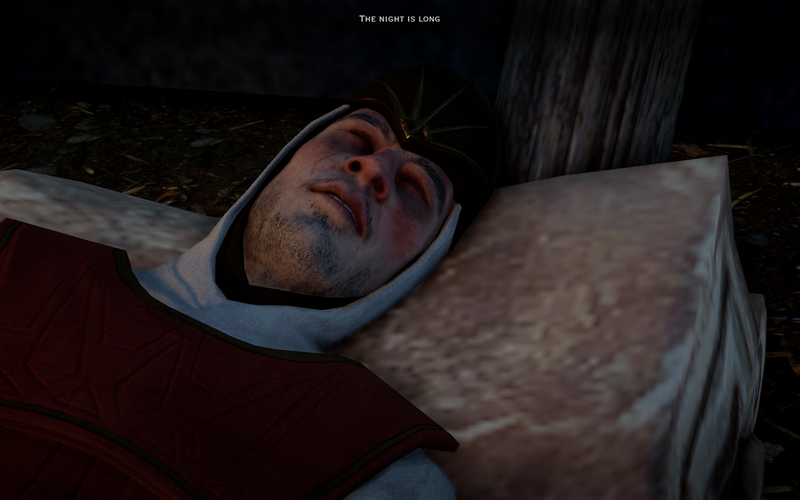 I can imagine worse deaths. you came through when it counted in the end. My absolute favorite aspect of the song, aside from Cole's quiet and gentle moment of compassion for the unnoticed passing of the petty little man who saved every life there, is the revelation at the end that Solas is watching all of this take place, and his expression of "What the hell am I witnessing?" is just priceless. But, in all seriousness, Solas is seeing the big picture. He recognizes that the Inquisitor—perhaps the elven Inquisitor—is shaping extraordinary moments whether they choose to or not. And he's mystified, intrigued and ultimately even slightly pleased. Mother Giselle caps the moment emphatically and smartly: "An army needs more than an enemy. It needs a cause." singalong is worth the price of the entire game. Her final words solidify the fact that Mother Giselle has just done something deliberate and complex, acting with full awareness of what the song would do for the people at camp. I believe that, as the good person she is, she believes what she says, but I also think she's being just as savvy and opportunistic as Leliana or Josie or... Roderick. She is being both genuine and subversive, political and religious. But I love that. I love the fact that Mother Giselle is doing something pretty blatant and cynical here—but she knows it will work, and that it is necessary and vital in order to get people motivated, hopeful and cheerful again. It's useful to note, by the way, that in this intensely religious and Andrastian moment that may or may not be shared by the Inquisitor, we see very few of our companions. This makes sense upon reflection, because the moment is really about communion, about Chantry belief, about bringing the Inquisition's primary advisers together. As a religious organization at its heart, any fractures after Haven would be both painful and nonproductive. So Mother Giselle has reminded Leliana, Cullen, Josie, and Cassandra to cast off fear and exhaustion, to look forward, and to rediscover hope. I would have found it fascinating if we had indeed seen Sera here. I think Sera might actually have joined in with the song. I think Bull, Blackwall and Dorian might have been moved by the warmth and sheer beauty of the moment (wholly aside from its religious connotations), and that, further, Bull would've been buoyed, simply enjoying the moment, even as Blackwall's feelings of guilt would have made him feel worse than ever on the inside. Viv, I feel, would have been privately dismissive and amused, although approving in a political sense. Meanwhile, the companion I most miss here is Varric, a man of real if hidden faith. What would he have done here? I don't quite think he would have sung along—as a skeptical and intelligent man, I think he wouldn't have wanted to put the Inquisitor in the position. But I wonder if he might have wanted to, secretly on some level. 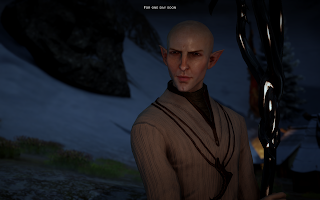 After the song dies away, Solas walks quietly up to the Inquisitor. "A word," he says. It is not a request, but a command. She follows. Then Solas sashays over to the solitary torch, and lights it with magefire and a casual, graceful wave of his hand. (By the way, I could watch Solas walk over to that torch a dozen times and not get tired of it. And maybe I already have. Don't judge me.) Anyway, Solas lights the torch, casting a lonely blue glow over the snow around them, then looks to the Inquisitor. 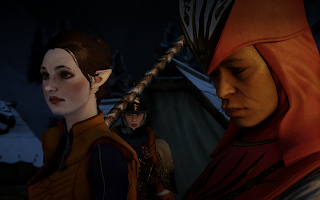 The differences in Solas's comments here, depending upon your Inquisitor's race, are intriguing. "A wise woman," he says. "Worth heeding. Her kind understand the moments that unify a cause. or fracture it. The Orb Corypheus carried, the power he used against you, it is elven. Corypheus used the Orb to open the Breach. Unlocking it must have caused the explosion that destroyed the conclave. I do not yet know how Cory survived, nor am I certain how people will react when they learn of the Orb's origin. "The humans have not raised one of our people so high for ages beyond counting. The faith is hard-won, Lethallan, worthy of pride, save one detail. The threat Corypheus wields, the Orb he carried, it is ours. Corypheus used the Orb to open the Breach. Unlocking it must have caused the explosion that destroyed the conclave. We must find out how he survived. And we must prepare for their reaction, when they learn the orb is one of our people." lies and his pants are constantly ablaze. "They were foci, used to channel ancient magics. I have seen such things in the Fade. Old memories of older magic. Corypheus may think it Tevinter. His empire's magic was built on the bones of my people. Knowing or not, he risks our alliance. I cannot allow it." Solas's response to a Dalish Inquisitor is highly interesting and suggestive, and again, here is one of the rare occasions on which he is actively lying to us. 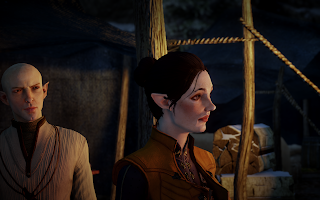 If, as we eventually learn, there were no actual elven gods, Solas is certainly putting on a good act here. Although, to be fair, it may also simply be the easiest way for him to explain the foci and how they work (note that he neglects to mention that this particular foci is tied to Fen'Harel). "Such things were foci, said to channel power from our gods. Some were dedicated to specific members of our pantheon. All that remains are references in ruins, and faint visions of memory in the Fade, echoes of a dead empire. But however Corypheus came to it, the orb is elven, and with it, he threatens the heart of human faith." A Dalish Inquisitor will then agree with Solas that no matter what, the elves will be blamed if the truth about the foci emerges. A sympathetic non-Dalish Inky will agree that he is right to be worried. Solas will then note that there are actions that can be taken so that such needless distractions are prevented. Then Trevor Morris's beautiful music surges... and off we go. 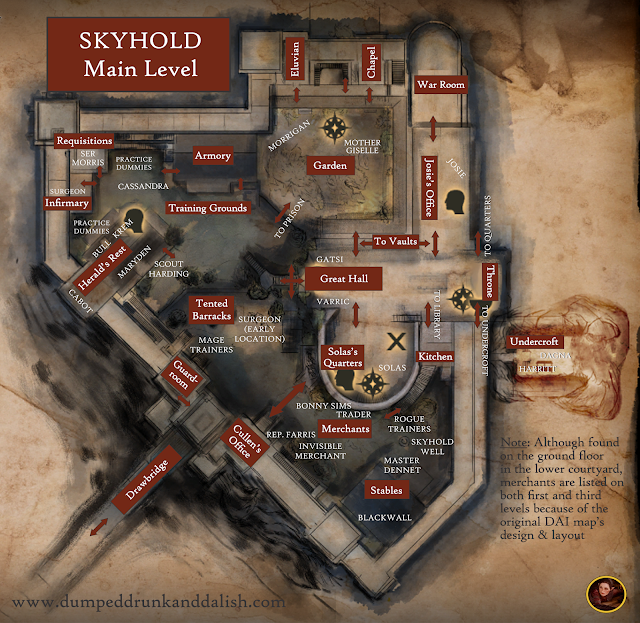 Next stop, Skyhold.